This past weekend, we participated in the Festival of Knowledge at the Western North Carolina Nature Center where children had their science fair projects on display. 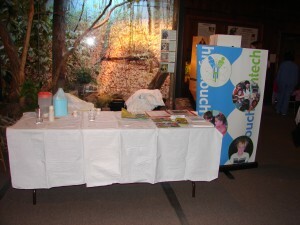 Our exhibit offered visitors and participants the opportunity to make one of our signature experiments, “space mud”! High Touch High Tech even gave out prizes to the winning science fair projects. Their programming really stimulates the imagination and curiosity of children. It truly was a wonderful day in which both science and nature were celebrated!